I had been to UVA before but I’d never shot a session there. I’ve always loved walking through their campus. The history, the beautiful grounds, and the area in general is tons of fun. I had such a great time exploring the campus with Mary and Parker! We checked out some gardens, old dorms, and even saw Parkers old fraternity house! These two were so incredible to see together. Parker was such an unexpected jokester. haha Hearing about all of his crazy escapades while at the University of Virginia was hilarious and a bit surprising. He initially comes off as a bit reserved but I quickly realized there was a lot of personality there. Mary is a lawyer, probably way smarter than me, and super sweet. The two of them are so incredibly kind. Especially toward one another. By the way they joke back and forth and poke at one another you can tell there’s a rich history between the two of them. After their session I had a great drive back to Lynchburg from Charlottesville! Seriously that drive never gets old. I’ve driven it quite a few times for weddings, engagements, and other shoots. It’s just as beautiful each time. 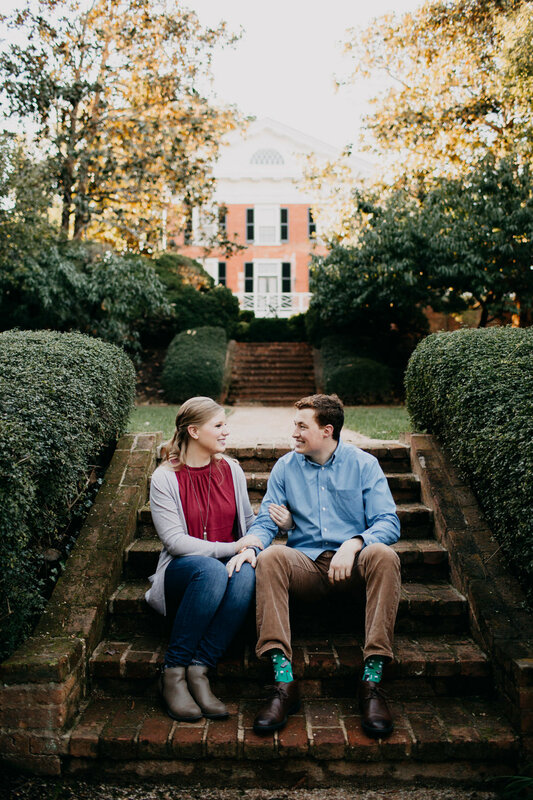 Also, I’m pretty dang excited for their wedding at the Boonsboro Country Club next September! It’s gonna be great celebrating with them!